THIS ITEM IS NOT AVAILABLE AT PRESENT. WE WILL NOT BE GETTING ANYMORE Star Wars The Force Awakens Catchphrase Game. From the Star Wars collection by Hasbro. Star Wars The Force Awakens Catchphrase Game. 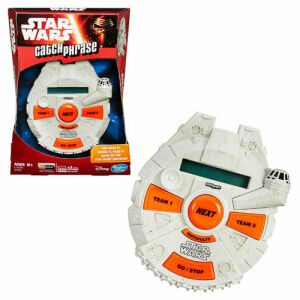 The Force Awakens Catchphrase Game challenges you to guess words and phrases from Star Wars until the timer runs out.